One of the biggest problems young girls and women face today is the expectation placed upon them to look “perfect.” With the media pushing unrealistic body images through heavily altered photos and videos, girls are constantly facing pressure to be thinner, resulting in major insecurities by the time they reach middle school. Just imagine how serious this matter gets by the time these girls reach high school! 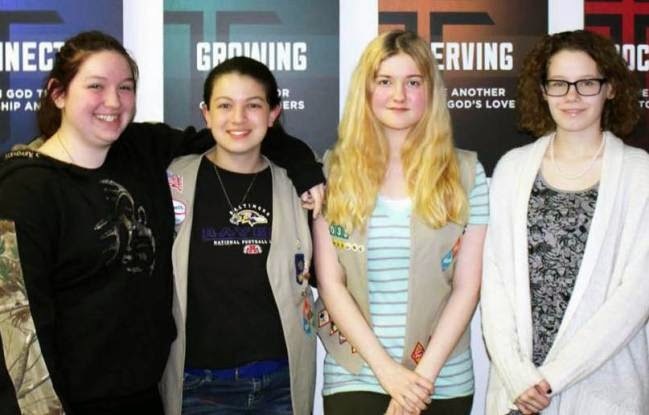 Thankfully, four Girl Scouts from York, Pennsylvania Troop 20033 took a stand to shed light on this troubling issue. The Girl Scouts—Gillian DeWit, 16, and Madison Reinsel, Maria Hilbert, and Sarah Philbin, all 15—were honored recently with the Senior Visionary Award for their project, which shed light on how the media affects girls' body images and encourages other young girls to celebrate their bodies rather than compare them unfavorably to what they see in magazines and on television and the Internet. The project requires Girl Scouts to develop an artistic representation of their ideal world, for which Troop 20033 made a 16-minute film, "The Perception." They conducted research for the short film by interviewing students from Stevenson University and other Girl Scouts about their perceptions of the relationship between the media and body image. They found that, while young adults are aware of how much photos in the media are altered, young girls aren't. The girls had one of their first opportunities to make a difference when, inspired by their research findings, they hosted a body image workshop for fourth- and fifth-grade girls. "Even though the media is changing girls' perceptions, there is still time to turn it around and make people see their self-worth," Madison said of her project. 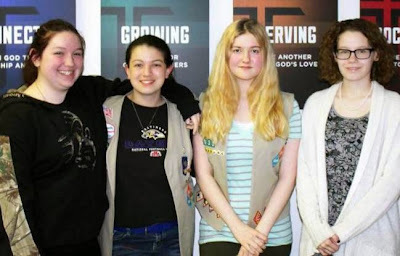 To fulfill the service portion of the project, Troop 20033 volunteered at New Life for Girls, a residential nonprofit that helps restore self-worth in women recovering from addiction and other life-controlling issues. The girls also held a movie night and bonfire—complete with s'mores, a campfire sing-along, and a discussion on the benefits of being a Girl Scout—for the women's children. "Volunteering was the most rewarding part," Maria said. "We were helping others and making their lives better. It is what Girl Scouts is about." The girls became role models for younger girls in their community, and they had more advice to share after they finished the project. "Don't be afraid to try new things and be the biggest person you can be," Gillian said regarding her award. The award is available to ninth- and tenth-graders whose projects present real-life opportunities to make a positive difference in other girls' lives. Congratulations to the girls of Troop 20033 for planting the seed of positive body imaging, thus earning the Senior Visionary Award and impacting the lives of many young girls. Read the original article from the York Dispatch here.